She first said she had a relationship with Mr Trump in a 2011 interview. The lawyer has previously said Mr Trump "vehemently denies" it occurred. 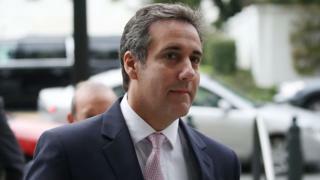 "Neither the Trump Organization nor the Trump campaign was a party to the transaction with Ms Clifford [Stephanie Gregory Clifford, her real name], and neither reimbursed me for the payment, either directly or indirectly," Michael D Cohen told the New York Times. He said he told the Federal Election Commission the same after a watchdog group filed a complaint about the payment, claiming that it had served as an "in-kind" political contribution to Mr Trump's campaign. "The payment to Ms Clifford was lawful, and was not a campaign contribution or a campaign expenditure by anyone," Mr Cohen said. In a 2011 interview with InTouch magazine, the actress said she began a sexual relationship with Mr Trump in 2006, shortly after Melania Trump gave birth to his son Barron. Ms Clifford was believed to be in discussion with US media about an television appearance to discuss Mr Trump at the time, the report said. Responding to questions from CNN about why the payment was made, Mr Cohen said: "Just because something isn't true doesn't mean that it can't cause you harm or damage." "I will always protect Mr Trump," Mr Cohen added.